Improving your putting is an effective way to lower your handicap. Lowering your handicap by 10 strokes is an accomplishment that can take years to achieve. If you're new to golf but find yourself improving quickly, you'll likely be able to lower your scores easier than someone who has played at the same level for several years. Lowering your handicap is about more than excelling at one aspect of the game; lower scores require an overall improvement. 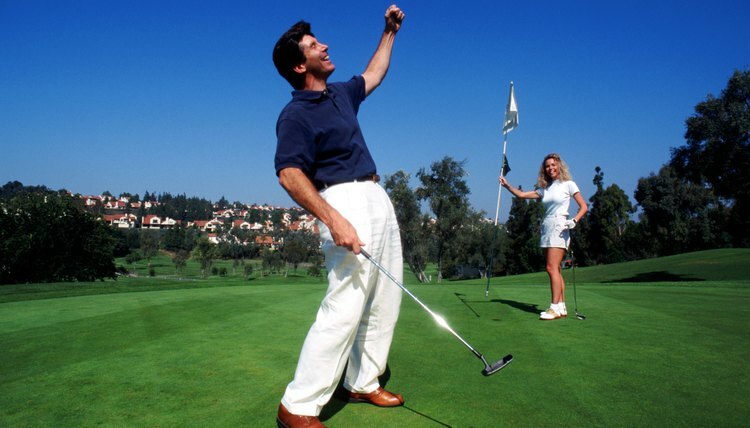 Practice your driving extensively at driving ranges to improve your accuracy. Driving distance is an important attribute, but a player who can drive with accuracy keeps his ball on the fairway, avoiding lost balls and shots out of the rough. Work on keeping the ball toward the center of your stance, maintaining your balance through the swing and avoiding pulling your hands toward your body at the point of contact. Consider an update to your clubs if you have trouble playing with long irons. Oftentimes, using a hybrid club instead of a 2-, 3- or 4-iron gives you more distance and height on your shots. Hybrid clubs are available in several lofts and are a staple in many players' bags. If you don't use your long irons, remove them from your bag to make room for one or two hybrid clubs. Concentrate on the form of your swing rather than using all your power. When you swing as hard as you can, you often increase the likelihood of slicing the ball or even mishitting it by hitting the top of the ball. Less power usually yields a more fundamentally sound swing that can lead to improved results. Practice your short iron and wedge play extensively to reduce the chances of making mistakes on your approach shots. Inconsistent iron play is often the result of hitting the ball with the heel or toe of the clubface, rather than the center. Through practice, you will get a feel for driving the center of your clubface through the ball, rather than clipping it with the side of the clubface. Develop a feel for your putter by practicing repeatedly on the practice greens at your golf course. Practice several putts from inside six feet, and then work on putts from 10, 15, 20 and 30 feet. If you can sink putts from inside six feet with regularity, you will begin to shave strokes off your score immediately. With practice, you will develop a better feel for distances and slopes.